Getting the batter just right makes all the difference when it comes to deep-frying fish or chicken. Too thick and it's like biting into nothing but fried flour, but too thin and it falls apart in the hot oil. Deep-frying batters typically include flour, a liquid and a leavening agent to fluff up the batter. 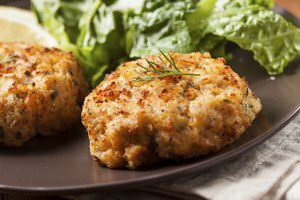 While fish benefits from a light batter that won't overpower the delicate flavors, chicken can handle a thicker batter that gives it a hearty crunch. Start with the same basic batter for both, adjusting the ingredients to suit the meat of your choice. Add a low-protein flour, such as cake or corn, to a large mixing bowl. Low-protein flours don't have as much gluten, which keeps the batter crisp for longer after frying. You can also use rice flour, which is gluten free. Season the flour to your liking. Depending on the flavor you're going for, you can add seasonings such as salt, black pepper, paprika, garlic powder, onion powder and cayenne pepper. Pour a liquid into the seasoned flour to create the batter. Add liquid equal to the amount of flour for a slightly thicker batter. While you can use water, adding milk or beer creates a richer flavor. Beer also adds carbon dioxide and foaming agents, which help create a light and crisp crust. 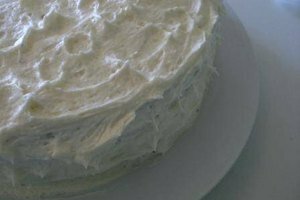 Adjust the liquid amount as needed for a thin or thick batter. Add a leavening agent like baking powder, baking soda or beaten egg whites to aerate and lighten the batter. Add roughly 1 teaspoon of baking soda or baking powder or 1 beaten egg for every 1 cup of flour. Chill the batter in the refrigerator for 20 minutes before using. This helps the batter adhere to the meat better. 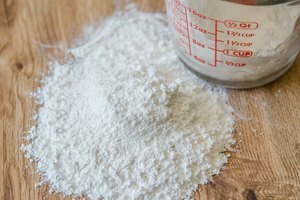 Batter containing baking powder should be chilled only briefly because it loses its leavening power quickly and must be cooked as soon as possible. For even crunchier fish or chicken, roll the protein in seasoned dry flour before dipping in the wet batter and then back into the dry flour before adding to the hot oil. You can also use seasoned cornmeal instead of flour. 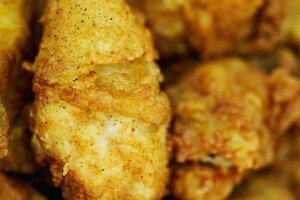 Ensure fish or chicken pieces are fully coated in batter on all sides and allow the excess batter to drip off before adding to the hot oil. While milk can add a richer flavor, it can also result in a softer crust that turns soggy faster than water or an aerating liquid such as beer.